The speed and scope of the business decision-making process is growing because of several emerging technology trends in Cloud, Analytics, Social, Mobile and the Internet of Things (IoT). Of these intertwined trends, Analytics is a game-changing business opportunity. With successful Analytics solutions, companies can deliver exceptional customer experience, enhance marketing effectiveness, increase operational efficiencies, reduce financial risks, improve product quality and reliability, etc. But these businesses are also challenged to make a compelling financial business case and manage the higher than normal risks and rewards inherent in their Analytics investments. Financing is an effective way to do this. With financing, companies can conserve cash, get early access to new technologies, refine precise solution needs and stage investments before committing large capital outlays, exit unprofitable projects and minimize losses, and economically upgrade to the most current hardware without worrying about outdated technologies. Financing also allows clients to better align their cash outflows with benefits as they progress on their Analytics journey from descriptive to predictive to prescriptive and cognitive computing. As the world’s largest captive information technology (IT) financier, IBM Global Financing provides a simple single financing solution with necessary funding approved upfront for IBM and appropriate non-IBM components. Cash outlays can be matched to benefits and specific milestones with attractive interest-rate protection. IBM Global Financing also provides asset disposition solutions and refurbished equipment to help clients with environmental and other corporate responsibilities. IBM Global Financing is an excellent choice for financing Analytics initiatives. The three year business case analysis presented in this paper compares typical IBM Global Financing with the alternative of paying upfront for three Analytics solution sizes and investments – small, medium and large. The quantitative model incorporates scaling factors for lower failure risks and greater rewards in later years as the solution succeeds and matures. Unsuccessful projects contribute to sunk costs which are smaller with Financing even when early termination costs are taken into account. These reduced sunk costs along with other attractive benefits of IBM Global Financing over Upfront Payments contribute to IBM Global Financing’s much higher (2-3 times) Internal Rate of Return (IRR) and lower (by 5-20 percent) Payback Period reported in this paper. Consequently, with IBM Global Financing clients can build a more compelling financial business case for their investment and improve their risk-reward profiles as they progress on their Analytics journey. IBM Global Financing is a very effective way to close a business case for investing in Analytics. The technical sessions and the end-user discussions in particular were superb and enlightening. Beyond, typical discussions on technology (Hadoop, Spark, Infrastructure, etc. ), the end-user panels repeatedly emphasized that organizational and cultural changes were critical to implement and integrate Analytics into core business process and drive value and competitive advantage. Analytics is not just about implementing a set of technologies or solutions, although, this is a necessary foundation for end-users to get derive business value. Analytics is actually a journey from a hunch to the punch where data is iteratively and progressively analyzed by the user and the system to produce powerful insights and punchy actions to outflank competitors and improve profitability. The prior figure depicts how clients can progressively get time critical insights and higher rewards. But the risks are also higher. 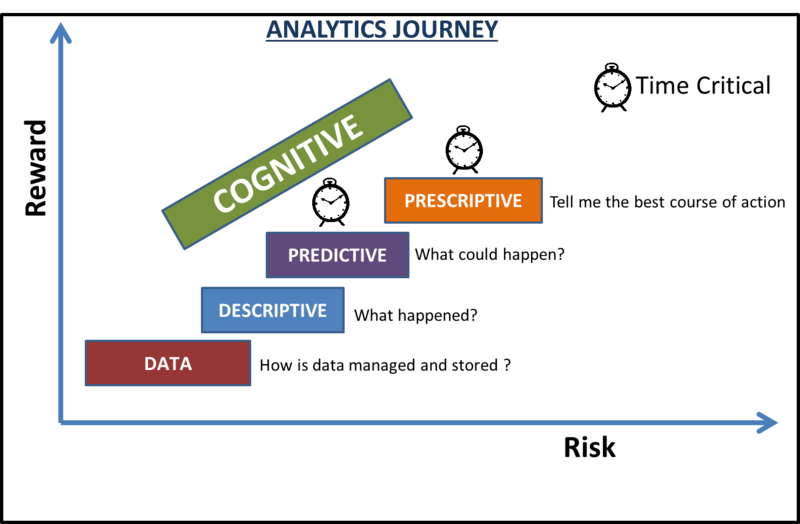 The Analytics journey starts with Data and advances to Descriptive, Predictive and Prescriptive Analytics. Data is fundamental in any Analytics initiative. A data warehouse is typically built to capture, store, secure, retrieve and manage the raw and processed data. Today, data warehousing is widely used by clients and traditional implementations are usually low risk activities. Modern warehouses with newer technologies such as Hadoop and Apache Spark are riskier to implement. But unless data is converted to insights, there is little reward. Descriptive analytics is dominant today and with low to medium risk and reward. It condenses data into nuggets of insights summarizing what happened. Social media analytics is one prominent descriptive analytics example. Predictive analytics (medium risk and reward) uses a combination of several statistical, modeling, data mining, and machine learning techniques to analyze data to make probabilistic time-critical forecasts about the future. Weather prediction and customer sentiment analysis are some noteworthy predictive analytics examples. Prescriptive analytics goes beyond descriptive and predictive analytics. It recommends one or more courses of action and the likely outcome of each action, including the usually time-critical “next best action”. IBM’s Predictive Customer Intelligence solution is one example. Cognitive computing systems continuously build knowledge over time by processing natural language and data. These systems learn a domain by experience just as humans do and can discover and suggest the “best course of action”; providing highly time-critical valuable guidance to humans. Cognitive computing spans Descriptive, Predictive and Prescriptive Analytics. IBM’s Watson is the premier cognitive system in the market today. Judicious investments in progressive Analytics competencies give clients unprecedented capabilities to not only validate their hunch, but also deliver a punch through fact-based Cognitive Analytics. These prudent investments, using Financing or Cloud subscription models based on achieving milestones, provide an effective way to mitigate risks while maximizing rewards; sparking widespread adoption of Analytics. After the dramatic win at the Jeopardy contest, IBM Watson received considerable buzz in the industry as a supercomputer with unparalleled intelligence. This unfortunately gave the impression that implementing IBM Watson is exotic and complex. But with the recent IBM Watson Analytics initiative with Expert Storybooks unveiled at the Analytics for All event in New York, a large portion of the software technologies underpinning the IBM Watson supercomputer is now accessible to all and easy to implement. In fact, IBM claims to have over 500,000 (small and medium business and enterprise) users for Watson Analytics just in the last several months. This could be the one of the fastest adoption rates of Analytics software in history, mirroring Apache Spark which is a critical Analytics software infrastructure for implementing deep learning and cognitive computing. Armed with critical and unique insights and recommendations from Analytics, get ready to punch your competition! Hey Supercomputer, Pause and Smell the Roses! 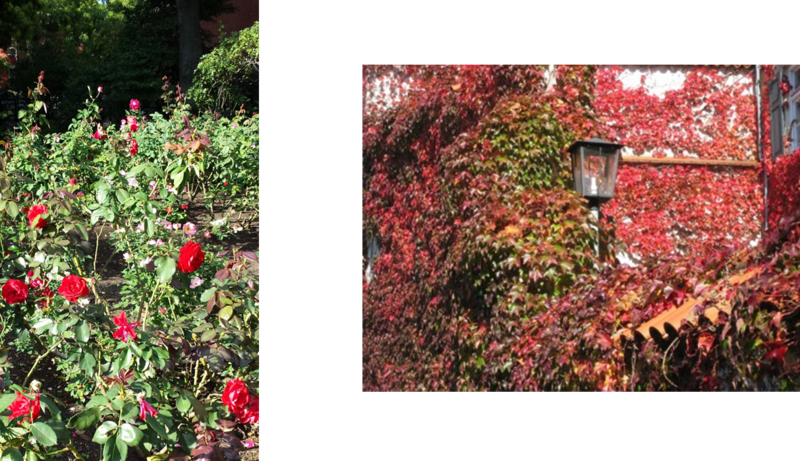 Enjoy these Fall Colors! I received an email on my Smart Phone a while ago from Herb Schultz (Marketing Manager, IBM Systems and Technology Group for Technical Computing and Analytics) with the agenda for IBM’s Technical Computing IT Analyst meeting the following week in NYC. I was having lunch then at one of my favorite restaurants in Duchess County, New York – McKinney and Doyle. While munching some delectable crispy calamari and realizing that the agenda covered Cognitive Computing, a train of thoughts sprouted in my mind. Was IBM planning to brief us on supercomputers that can smell, see, hear, touch and taste? Savoring that Crispy, Crunchy Calamari! I was told once by a gourmand that fine food must appeal to all our five basic senses. As our waiter came from behind me and brought the food, I first smelled a pleasing aroma. Then, the calamari served over citrus coleslaw with sweet and sour chili sauce was a gorgeous sight. Each calamari piece that I touched was perfect – not soggy or oily. When I placed the warm, crispy and coarse calamari on my tongue, it produced a delightful tingle. I then began slowly munching each piece; enjoying the gentle rhythmic crackling sound with every crunch while simultaneously savoring the mouthwatering taste. I thought – Is IBM going to tell me that all these fine sensations will soon be replaced by a computer? Being a foodie, that prospect was disappointing! Fortunately No! – It’s Also about the Next Evolution of Big Data Analytics! When I went for the briefing the following week in New York, I realized what IBM’s vision and path to Cognitive Computing is not illusory, exotic and far out into the future. But it is a natural evolution of a Big Data trend that’s happening today in areas such as healthcare and in other industries that are leveraging Big Data for Insights, Knowledge and Wisdom. In many ways, this vision of Cognitive Computing is similar to the Georgia Tech Cognitive Computing Laboratory vision. A few weeks later at the IBM Edge Conference, when I was having a dinner (again savoring another delectable appetizer) with Jay Muelhoefer (Worldwide Marketing Executive, IBM Platform and Technical Computing) and his team, I learnt that IBM had won a major competitive deal with an Asian Communications Service Provider (CSP) running a Big Data workload. Jay suggested that it would be good to write up this case study to highlight the use of Big Data in Telecommunications and how IBM improved Customer Service for this CSP. For the customary Cabot Partners’ fee, I signed up to write this paper – Big Data: Delivering an Agile Infrastructure for Time-Critical Analytics in Telecommunications – which you can download by filling out a simple form. Just like the right balance of the five senses satiates and heightens an individual’s dining experience, to maximize business value, supercomputers must possess five critical elements – performance, reliability, manageability, efficiency and serviceability. This requires – as illustrated by the Telecom example – a combination of hardware, software and skilled people all working in tandem to maximize a client’s business value – just like a memorable dining experience requires fine food made with the freshest ingredients, a nice ambiance and great company. As We Hurtle Towards Supercomputing 2013, Chill! There’s Value in Slowness! When the world’s fastest supercomputers are unveiled next month in Denver, Colorado, there will undoubtedly be much media hoopla around the Top500 list. IT vendors will compete fiercely as they always do. They will incessantly brag about their position in this list and how fast their systems are in the Top500 benchmark. But amidst all this noise, you should also be cognizant of the other key elements (senses) that must also be measured and highlighted for supercomputers (cognitive computers). But pause, let’s step back, take a deep breath and realize that according to some philosophers this sensory world is just an illusion – They call it Maya! In a Mayan world, does it matter that computers can smell, see, touch, hear and taste? I called my parents in India this morning. I do this almost every day. But I realized that today (Oct/2) is Mahatma Gandhi’s birthday and his 144th birth anniversary. Then, during my morning jog, in the neighborhood park, on this lovely autumn day in Connecticut, a train of thoughts rushed through my mind. I want to keep this short — especially since I am now reading a book titled How to Write Short — and post it on the Cabot Cloud Computing blog because everything is in the cloud these days! In addition to my parents and grandfather, growing up as a young boy and attending the St. Vincent’s School in Pune, India, I was influenced by two centenarians who recently celebrated their centennial birth anniversary: Rev. Fr. Rudolf Schoch (100 years) and the other Mahatma Gandhi (144 (12 * 12) years – “100” in the Duodecimal (base 12) number system). Mankind decided to broadly adopt and popularize the decimal system out of sheer serendipity and convenience instead of alternative systems such as the duodecimal system. So today, we have ten digits instead of a possible twelve digits in the duodecimal system or sixteen in the hexadecimal system, etc. Fr. Schoch was a great admirer of Gandhi. I have fond memories of listening to him teach classes on Gandhian thought and values. He was our principal at St. Vincent’s when I first entered St. Vincent’s in Grade 1. Then he returned as principal again when I was in Grade 10. I consider myself privileged to have had the opportunity to learn about Gandhi from Fr. Schoch. I paid close attention to his classes despite my singular fascination, those days, with math – even at the risk of failing at other subjects. Today, I am glad to have listened and learned from Fr. Schoch. He and his many Jesuit contemporaries built the strong educational system (schools and colleges) in India. Their efforts continue to make our world a better place. So, let’s celebrate the centennial birthdays (in two different number systems) of two great men who each toiled to uplift mankind – one very personal to me – a Jesuit priest who dedicated his life to educate the poor and needy “making gentlemen out of boys” and the other a freedom fighter and an apostle of non-violence “shining light on a nation”. Yes – the intense focus of modern educators these days is on numbers and letters (reading, writing and arithmetic) and science, technology, engineering and mathematics (STEM). But when the cloud clears, the enduring lesson from these two centenarians is pure and simple: focus on building enduring values. To Tame the Onslaught of Big Data, Better Drink Your V8. It will make You Healthy, Wealthy and Wise. IBM Global Entrepreneur SmartCamp in New York City. In our previous blog, we discussed, in some detail, several synergistic emerging computing technologies including #Social #Mobile #Cloud #HPC #BigData and #Analytics that will make profound business impact in 2013. We articulate this coalescing rainbow shine in this video. Over the course of the next several weeks, as time permits, we plan to detail this mosaic of emerging computing technologies through several new blogs. But now, I want to delve deeper into how you as an IT professional can make your organization wiser by leveraging #BigData, #Analytics and #Optimization. This topic is vast, impacting many stakeholders and roles in the modern enterprise. But here, I restrict the discussion to areas most relevant to IT professionals – CIOs, Directors of IT and their staff. The IT professional must have a deep understanding of several Big Data attributes and invest in solutions to address these challenges. Volume: This is the amount of data generated in bytes and provides insights on how data is growing and/or expected to grow over time. Today, many enterprises generate tremendous amounts of data that is unstructured and the associated metadata alone can quickly reach thousands of terabytes. Variety: This indicates the type of data generated including structured or unstructured. Understanding data variety aids in decision-making and provides greater process insights. Velocity: It determines the speed and efficiency in capture, storage and retrieval of data and often drives performance and availability requirements. Veracity: This establishes the authenticity of data that is available to perform analytics and to arrive at useful insights. Data veracity shapes the final strategic actions and is dependent on the accuracy of data. To this list we add Vulnerability. In today’s #mobile era, with a proliferation of numerous access points and devices and a distributed workforce, IT has become even more concerned with data security. Vulnerability: This establishes how susceptible corporate data assets are to a plethora of possible malicious attacks. Very comprehensive security solutions are needed to protect strategic data assets. Visualization: This helps IT Managers better fathom data growth and patterns and produce actionable insights to better optimize their IT environment. Users can also visualize and traverse enormous data quickly – even in real time – to draw actionable insights and steer subsequent analyses for better business outcomes. Virtualization: This allows the integration of large data volumes with already-stored data to perform new forms of analyses and predictive modeling. All the data is typically stored in a centralized data warehouse that provides storage and integration for multiple data sources. Virtualization offers the right technique for reuse of datasets across multiple applications and improves data management efficiencies. Finally, IT must enable users and the business to leverage data to create Value. Value: Enterprises can unlock the business value by leveraging existing data assets to create information, insights, knowledge, and ultimately greater profits. Using advanced software tools and technologies, enterprises can analyze huge amounts of data to reveal unseen patterns, links across various domains to drive new levels of innovation and customer intelligence. “By drinking this V8”, IT can enable the entire organization to be more resilient; make faster, better and wiser decisions; and transform the business. Beyond V8: Veni Vidi Vici! But to constantly enhance organizational Vitality, you must “drink fresh V8” and make it an organizational routine. Aged data is like canned juice which often loses many vital nutrients and Vitamins. 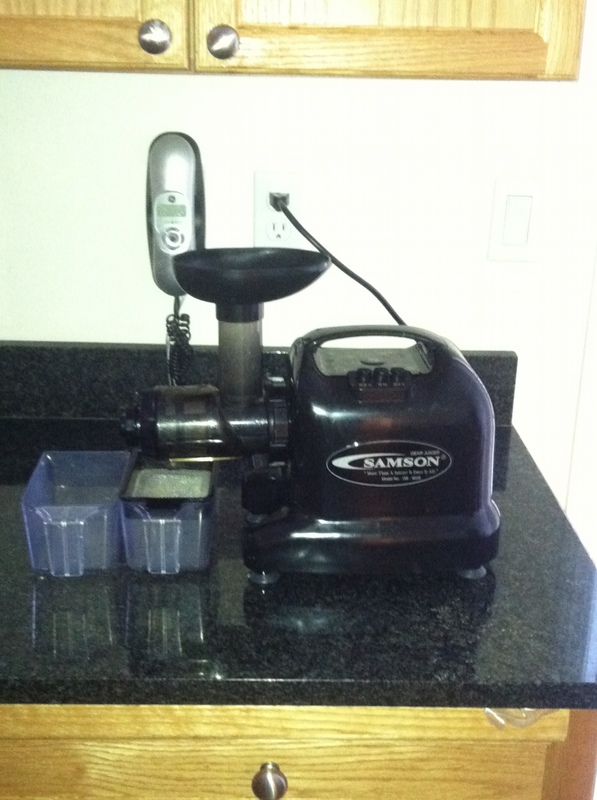 When my son demands and drinks his fresh apple juice with a twist of ginger and lime from the masticating juicer shown above, he has a sated contended smile on his face. That smile makes all my angst from Big Data and life Vanish! 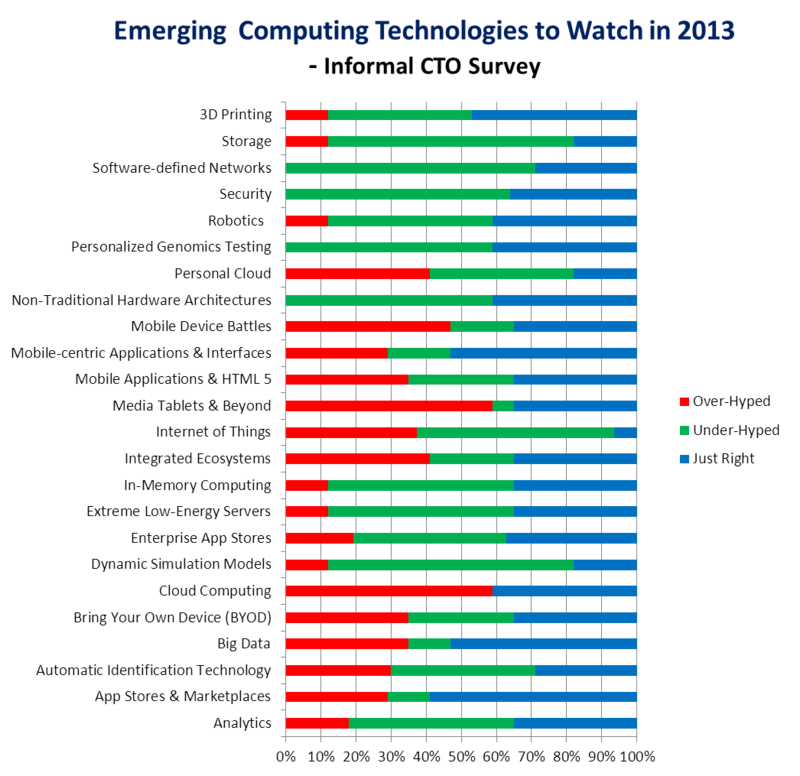 Cliff, Cliff on the Hill: Which Emerging Computing Technologies (ECT) to Watch in 2013? Our best wishes to you, your families and friends for a Happy, Healthy, and Prosperous New Year. Much of 2012 was a stimulating hike through the emerging computing technology (ECT) landscape; with the last month or so being an exciting steep ascent culminating at the ECT Cliff. Our year-end climb started with our participation at the exciting annual Supercomputing 2012 event (#SC12) in Salt Lake City in Utah. Then, we attended the annual #IBM Software Analyst Insights conference in Stamford, CT. And finally, we attended the monthly Connecticut Chief Technology Officers (CTO) club in mid-December before winding down for our annual holiday in 2012. Already, 2013 is shaping to be an exciting year here in Connecticut. Fortunately, we did not fall over the cliff – fiscal or otherwise. It is refreshingly cold and crisp here. And after this morning’s stimulating hike, I pause and reflect on what the hike through ECT landscape in 2013 may look like from the edge of this ECT cliff while relishing a breathtaking view that is truly amazing – gazing at the horizon taking in the first rays emanating from the rising sun. Reflections on what the ECT landscape may look like 2013 are almost as wondrous and awesome as the rising sun. But unlike the sunrise that can be predicted with great accuracy, ECT predictions even for a relatively near-term horizon i.e. only 2013 could be far off-target! But rather than just provide my undoubtedly biased individual view, I thought, it may be valuable to share what a small group of Southern Connecticut CTOs viewed as key ECT items to watch in 2013. December 2012 Connecticut CTO Club Meeting Informal Survey – 2013 will be the Year for Analytics! At our last CTO club meeting for 2012, we had a vigorous and stimulating discussion on what the group assembled there considered were the key emerging computing technologies to watch in 2013. We put up a list and then this group of about 18 individuals representing technical leaders across various companies – large and small – in southern Connecticut and New York – voted on whether they thought these technologies were Over-Hyped, Under-Hyped, or Just Right. Some items in the list were broad areas i.e. Storage and Analytics. While others were very specific technologies i.e. Automatic Identification Technologies, Personalized Genomic Testing, and In-Memory Computing. So, there was considerable variance in this list. Nevertheless, being an informal list, it covered considerable ground in the ECT landscape. We even listed broad mature categories like Storage as they have emerging technologies to watch i.e. Solid State Disks, Flash Memory, etc. Clearly, Extreme Low-energy Servers are just emerging as a category. Here are the informal survey results. Some key observations from the above chart: The topics most thought were over-hyped were Cloud Computing and Tablets. The ones they thought were most under-hyped was Software-Defined Networks, followed by Dynamic Simulation Models and Automatic Identification Technology, along with Non-Traditional Hardware Architectures (GPU computing and ARM) , Extreme Low-Energy Servers, In-Memory Computing, and the Internet of Things. When asked what were the technologies that would have the most impact in 2013, Analytics won in a landslide (58% mentioned it). Cloud Computing (35%), Big Data (29%) and BYOD (also 29%) also did well. So perhaps, 2013 will be the year of Analytics! Greater the Impacts When Several ECT Trends Combine …..
We are always awed by the potential impact of any one ECT trend, but we become ecstatic when several ECT trends combine together to significantly improve our personal and professional lives….each ray of the rising sun is lovely, but when these rays coalesce and illuminate the vast gorgeous valley below the cliff, that view is breathtakingly stunning! First, let’s just consider four larger ECT category trends: mobile, cloud, analytics, and social. When mobile and cloud combine, we get the CloudMobile! With Software Everyware and in the CloudMobile we can leverage the power of SocialAnalytics. Next, with a High Performance Computing (HPC) infrastructure, which someone aptly said is constantly emerging, we can support mankind’s ECT journey. And with Storage, Personalized Genomics Testing, and Non-Traditional Hardware Architectures capable of large In-Memory Computing, we could develop Novel Next Generation Genetic Sequencing solutions that could significantly change the Economics of Healthcare! But we need enterprising doers, managers, and leaders to invent, develop, nurture, evangelize, adopt, and use these Emerging Computing Technologies. In 2012, we have been very fortunate to interact with several enterprising individuals. Clearly, the members of the Connecticut CTO club and the Faculty, Staff and Industry Members of the Wharton Emerging Technology Center are enterprising individuals with a passion for ECT. But I wanted to specifically call out others who we recently met or interacted with at #SC12 or the IBM Software Analyst Insights event. These individuals (doers, managers, and leaders all in one) have enriched our lives with their passion for ECT. Combining the promise of Big Data with the power of High Performance Computing and Analytics is Gord Sissons, Sr. Marketing Manager at IBM Platform Computing for the IBM Platform Symphony offering. Joe Landman, CEO of Scalable Informatics is pushing the envelope in very high performance storage. Gord and Joe are classic examples of entrepreneurs and technical innovators. Chad Harrington, VP of Marketing at Adaptive Computing – a HPC and Cloud Software Company is a top-notch evangelizer of the business value of ECT as is Karl Freund, VP of Marketing at Calxeda, a company building extreme low-energy servers. Last but not the least is Jim Corgel, General Manager of IBM’s Developer Relations organization. At the IBM Analyst Insights event, I had the unique opportunity to listen to Jim talking about how he plans to expand the very successful IBM Global Entrepreneur Program. While I was definitely in agreement with the content and strategy of Jim’s presentation, I was even more impressed with Jim’s passion and zeal to drive innovation in the partner ecosystem with targeted initiatives around four ECT areas: cloud, social, mobile and analytics. Jim’s body language and presentation exuded the passion and optimism of a doer typically found in technology entrepreneurs and innovators. This, in my opinion, is rare especially given Jim’s immense responsibilities of managing a partner ecosystem worth over tens of billions of dollars to IBM. 2013: The Best Year for Emerging Computing Technologies Yet – Let’s All Smile. Despite Connecticut’s (and the entire Tristate area’s) travails with the recent devastation caused by hurricane Sandy and the absolutely horrific shooting in Newtown, CT (this is just a few miles away from my home), 2013 will be good a year. This is almost as definite as tomorrow’s magnificent sunrise – I remember vividly sitting at the deck of my friend’s (Bob DeLuccia – a Biotech entrepreneur himself and now co-founder of DiPexium Pharmaceuticals ) home on the shore at Long Beach Island in New Jersey this past summer discussing how delightful it is to witness the splendor of the rising sun. Fortunately, Bob’s house suffered minimal damage from hurricane Sandy. Entrepreneurs and the enterprising individuals involved with ECT are, by nature, optimistic. One of the greatest compliments I received, in a prior life as CEO of a startup software company, from our lead investor – just as he was pushing us towards a Chapter 11 bankruptcy – was that I remained optimistic about the immense market potential of our startup’s software technology. That is probably a manifestation of the Karmic values and the Gandhian outlook that were part of my upbringing. Gandhi was clearly a rare transformational leader in a millennium. But almost every day for an hour or so, he as a doer, sat silently and intensely concentrated on his manual task of making cloth with a Spinning Wheel. Our job, as IT analysts, is to similarly concentrate and meticulously observe with awe and analyze and catalog the wonderful impacts of these marvelous emerging computing technologies in 2013. But nothing makes me more euphoric than to witness one of my twin boy’s mischievous smiles. And when both twin boys smile mischievously together, that euphoria more than doubles! Ratcheting up the “Flops”, the US regains Supercomputing Leadership. Keep the Innovation Flame on! This week’s big supercomputing story – It’s Red, White and Blue and … Green too! This past Monday (June/17), as I was sitting outside; reading and enjoying the nice sunny weather on the East Coast, I received an email alert that delighted me and put me on a joyous reflective state. At ISC 2012, the Top500 list of supercomputers worldwide firmly established that, after a span of almost three years, the United States has regained that envious and prestigious floating point performance leadership position in supercomputing or High Performance Computing (#HPC) – wresting this away from other world-class manufacturers. The fastest supercomputer in the world is the IBM BlueGene/Q (Sequoia), installed at the Lawrence Livermore National Laboratory, and achieved an impressive 16.32 petaflops/s on the Linpack benchmark using 1,572,864 cores. The BlueGene/Q is also the top system in the Graph500 list, which ranks supercomputers by a data intensive benchmark that mirrors workloads common in graph applications including social networks, cyber security, and medical informatics. And the BlueGene/Q is also the Greenest supercomputer according to the Green500 list that ranks supercomputers by energy-efficiency benchmarks! Moreover, the fastest supercomputer in Europe is the SuperMUC, an IBM iDataplex system installed at the Leibniz-Rechenzentrum in Germany and cooled by warm water. This is a great testament to US innovation in the computer industry. Going forward, one fundamental question/challenge in supercomputer design is; how can we keep heat away and cool these systems to run reliably and efficient as we scale up performance? For this, innovations in cooling technologies, low-power processors, and the rest of the technologies must all come together to build that gigantic jigsaw puzzle – the exascale system! The center of gravity of this pursuit, while historically firmly entrenched in the US since the dawn of the information age, seems to be lately seesawing between the US and Asia. Today, it is in the US. One question is how can the US reinforce and sustain this edge and arrest this seesawing jigsaw? However, a bigger question is how can the US keep the flame and heat on the escalating tussle for an edge in innovation and on the seesawing race for leadership in today’s global knowledge economy? Today (June/21/2012) this heat is literally on. It is not only the longest day in the northern hemisphere but it is also the hottest day here in Connecticut! The sprint towards exascale is just one proxy for this larger battle. To win, we must flex our neurons. For this we need relentless focus and continuing investment in education – particularly in math, science, and language. Our teachers are our personal trainers and the classroom is the gym. But beyond, traditional classroom education, we must experiment, constantly learn on the job and not be afraid to make and learn from Brilliant Mistakes. Moving on and learning from these Brilliant Flops (a.k.a. Mistakes) is of greater benefit to innovation than merely ratcheting up the supercomputing Flops! May the Olympic Torch of Innovation continue to shine on the United States!